May Day 2018 in Fontana. 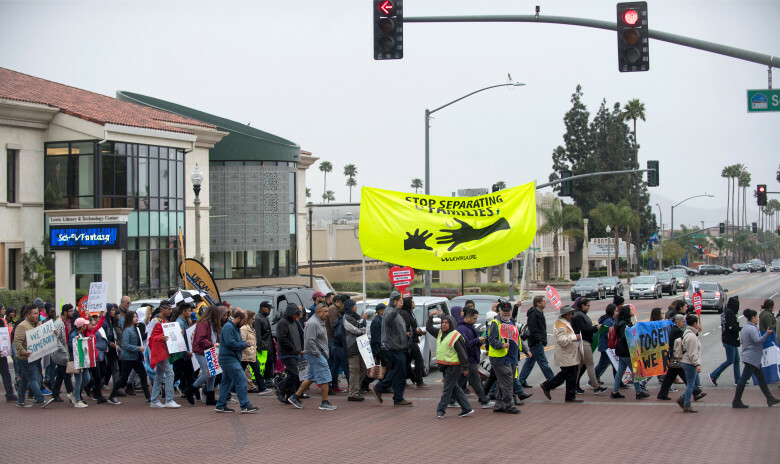 FONTANA – A march in support of immigrants, workers and students drew a couple hundred protesters to the streets on May Day. Participants gathered Tuesday, May 1, despite the cloudy skies and threat of rain to lift their voices in support of workers and Senate Bill 54, the California Values Act, which shields undocumented immigrants from deportation. The gathering echoed others around the country on Tuesday, International Workers’ Day. Protesters also used the gathering as an opportunity to call on the Fontana Unified School District to remove AR-15 semi-automatic rifles it purchased several years ago for campus police. “If the challenges are wide ranging and systemic, change will come by demanding better policy, demanding better leadership, and working with our neighbors,” Bobbi Jo Chavarria, a Fontana resident and community organizer, said in a news release prior to the march.